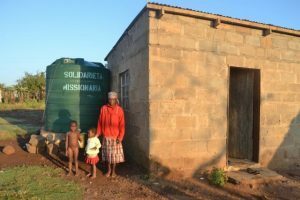 Caritas ESwatini Food Security and Rural Development Programme has installed six 5000 litre rain water harvesting polystyrene tanks for vulnerable households at Lubulini in the Lubombo region. This region is one of ESwatini’s worst economically disadvantaged regions. The project is funded by Solidarieta Missionaria from Italy. There are 38 (thirty-eight) direct beneficiaries. The majority are elderly people who stay with orphaned and vulnerable children who can no longer walk long distances in search of water for domestic consumption. One of the major advantages of harvesting water is that rainwater is a free source of water and by harvesting it; you can easily cut down on your your time travelling long distances to look for water. This can be great saving of time and energy if you are harvesting the water for domestic use. It brings a smile to elderly people who are assisted to realize this potential. The only essentials that you’ll need to harvest your own rainwater are a collection system, storage tanks and a simple pipe or tap system to use the water. A simple way to collect rainwater is by using the rain gutters on the roof and directing the runoff to your storage tank – it’s that simple! • Making use of a valuable resource that is free.